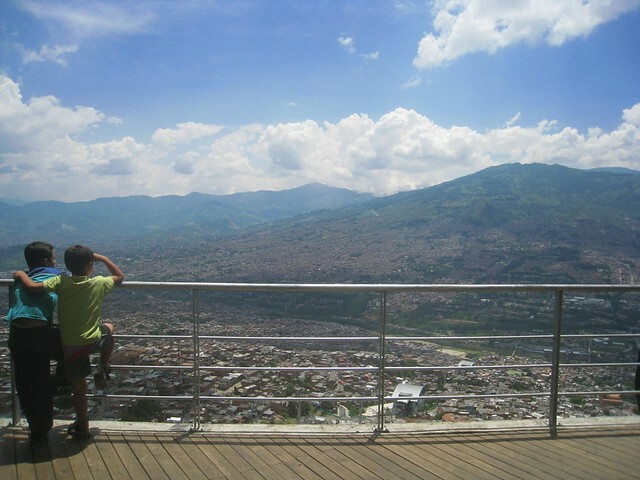 I remember enjoying the first metro cable car ride I took in Medellin, so I finally struck off months later to check out the second one farther north in the city. It was a typically beautiful day and I got some great photos. Reaching the cable cars is incredibly easy and convenient – simply look at any of the well-designed maps along the metro lines. Unlike the other cable car, this one’s path and terminus seemed to have received more investment in terms of beautifying the neighborhoods, or at least the sidewalks, streets, and often imposingly steep staircases. After riding up the mountainside, I disembarked, leaving my young Colombian co-passengers to return back to the train without me (the cheap approach). I walked down to a viewpoint under the cable car, passing food vendors and little shops. I headed for Biblioteca Espana. 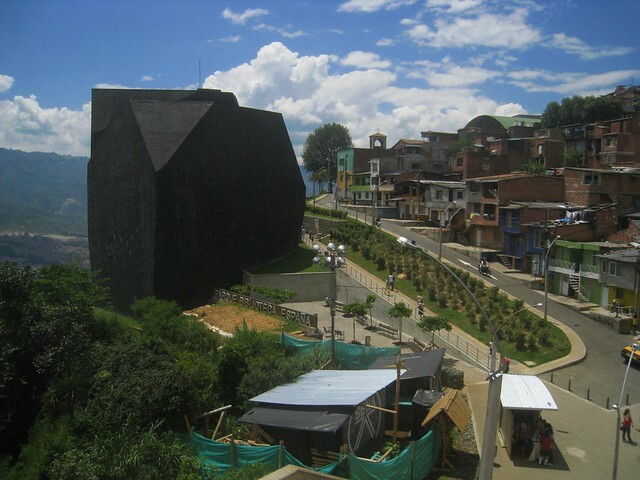 The building’s dark black profile stands in stark contrast to the pretty blue skies filled with white puffy clouds, and the green mountainsides with their red brick buildings. The line at the entrance was enough to deter me from going inside though. I took a few more photos, and as I walked back toward the cable car, lots of little kids were on the loose, playing outside. I stopped for an ice cream, and watched some older guys stretch in preparation for a semi-indoor soccer match on a concrete playing field. And then I descended back into the valley and more familiar territory to continue with my day. 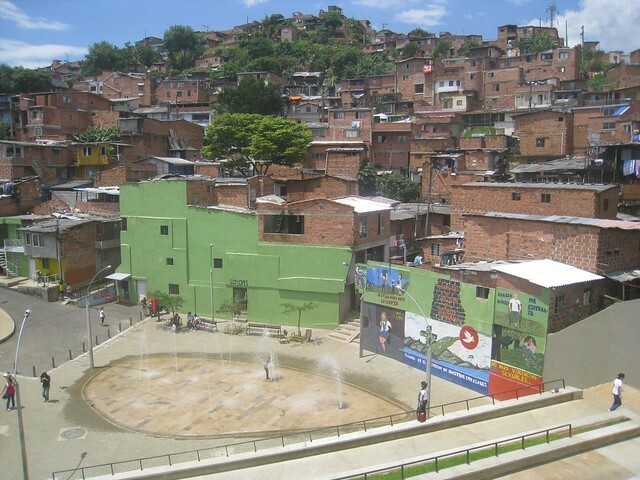 I am living in Medellin for a month and following this website. I really like it! Just been to Biblioteca Espana with the cable car, which was a really nice trip. I’ve a recommendation for anybody who wants to visit the place… across the Biblioteca there’s a restaurant called La Mesa del Barrio. They have the best food I ate in Colombia so far, really delicious, well presented, cheap (only around 10,000 pesos for a main course) and nice personnel! Also the coffee they served was really amazing, although I must say I don’t have a lot of experience with Colombian coffee to make a good comparison. Visit the restaurant next time, you won’t be disappointed! Nice post Dave! 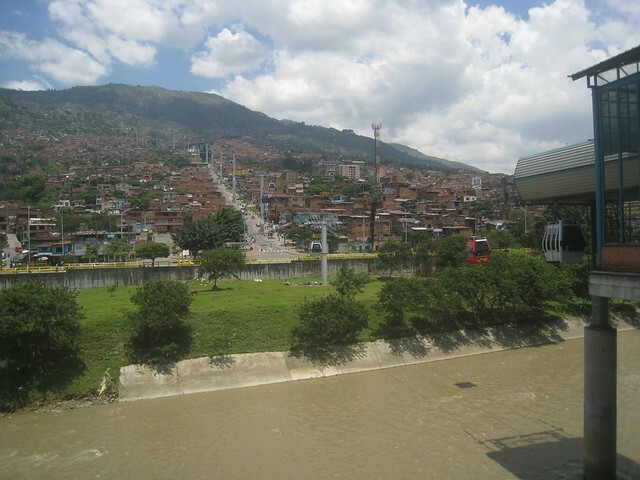 I was just having a discussion regarding the Medellin Metro Cable Car and whether or not it was actually safe for foreigners to make the trip (I was told that it was not in fact safe). It sounds like you didn’t have any issues? Sarah, I read your related blog post where you ask this question, and have experienced the same confusion about where it is and isn’t safe to travel in Medellin, and Latin America for that matter. While the Metrocable goes over poorer neighborhoods, I’ve never heard about any tourists running into trouble at the areas where you get off and look around (specifically the line that goes to Biblioteca Espana, which is the more popular one to ride). Unfortunately, I’ve heard a lot of robbery stories from tourists and expats over the years, and been a victim myself (last year), but NONE of those stories came from riding the Metrocable. That’s not to say it couldn’t happen, but I don’t think it’s any more dangerous than walking around other parts of the city. If you’re still concerned, go with a Colombian from the Medellin Couchsurfing group, or a bunch of other travelers (including at least one guy). You don’t even need to get off the cable car. Simply stay on it and go back down to the metro station, taking in the views that way (though the photos won’t be as good).